SDS/2 v7.2 changed how the Model Complete feature works. With a Model Complete date set, the member and all its attached submaterials are completely locked down. This impacts multiple items, including Piecemarking and Change All. 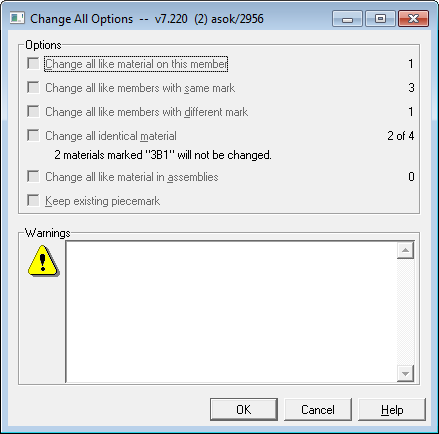 When a member is changed that has multiple members with the same piecemark, but one or more is marked Model Complete, SDS/2 will alert the user with the new window. The window states there are four members that are the same, but only three are editable. Selecting Yes on this screen will break out the edited member from the Model Complete member. If there are more than two or more editable members and Yes is selected, they will all be broken out from the Model Complete member. If No is selected, only the member that was edited will be changed. Since materials on a Model Complete member are also locked down, you will run into a similar situation when trying to edit materials. In this situation, there are four "3B1” materials, but only two of them will change; this is because the other members that have “3B1” on it are marked Model Complete. By selecting OK on this screen, members that have edited "3B1" on them will be broken out from the Model Complete members. In SDS/2 v7.220 and higher, there is a way to change all members, even when members are marked Model Complete. When something in the Member Edit screen is changed and Redesign Connection is selected, the 7.1 Change All screen will appear. If Yes is selected, all the members will be changed, regardless if Model Complete is applied. If you have any questions about using the Model Complete feature in v7.2, contact your support representative.